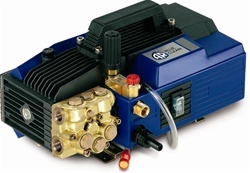 Made by the renowned Annovi Reverberi (AR) one of world’s leading pump manufacturers. The AR630 is a powerful high pressure cleaner It comes with trigger gun for positive shut off and user safety, pressure adjustment –to tailor pressure to the application, pressure gauge, automatic safety valve with low pressure by-pass, built in detergent suction, tank, easy clean mesh designed water filter – to protect the pump, twist fast coupler for quick removal and attachment of pressure hose. A safety lock prevents the trigger from accidentally engaging when not in use. It is equipped with a GFCI to shut down power supply in the event of electrical ground failure.